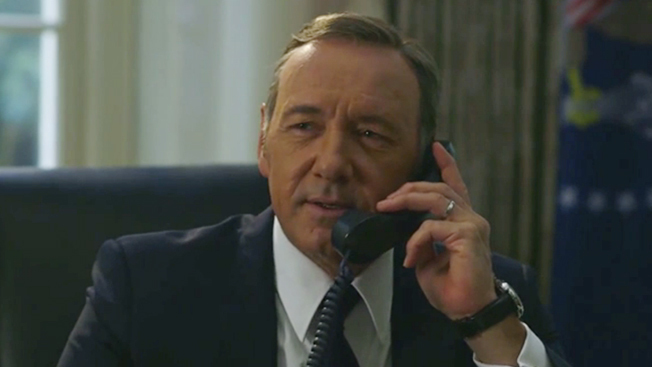 Kevin Spacey, more or less in character as House of Cards' South Carolina politician Frank Underwood, stars in this ad for the Clinton Foundation, keyed to Bill Clinton's 68th birthday. Spacey, in the "Oval Office," prank-calls Hillary as Bill to ask an unreasonable birthday favor (hey, get your mind out of the gutter) and still doesn't manage to find out whether she's running for office. It's a funny use of the character, who A) isn't terribly nice and B) is the property of Netflix—but the distributor seems to be taking a laid-back approach to Spacey's use of the persona around the media world and that's probably a good thing. It's also pretty good advertising for the show, which is a big deal especially among people who have a lot of opinions about Beltway minutiae. Moreover, while this is ostensibly an ad for the Clinton Foundation, it's also a very clever, contemporary piece of political advertising given that Clinton herself needs to stay in the public eye if she's running but can't very well announce her candidacy this early. One thing we saw two years ago was that you can't just slam ads up on the Web and hope for the best—the creative has to be funny and engaging. This isn't exactly the new Shakira music video, but it's better than the rest of the political ad sundry.